As we get closer to the equinox, that can only mean one thing: Sabbat Box has delivered yet another well-compiled goodie box to many pagans around the US! Similar to the Loot Crate concept, Sabbat Box offers sabbat-relevant items from pagan-owned small businesses two weeks before each holiday. The box's value always exceeds the price, making it a great value to the beginner and experienced pagan alike. I actually received my box a few weeks ago, but with the craziness that has been our life lately, I only just got around to opening it. I wish I had done it sooner! Circle of Fountains already had our Mabon ritual and some of the items in it would have been perfect! But many of the items could also work for other holidays or uses, so I'm not remotely disappointed. 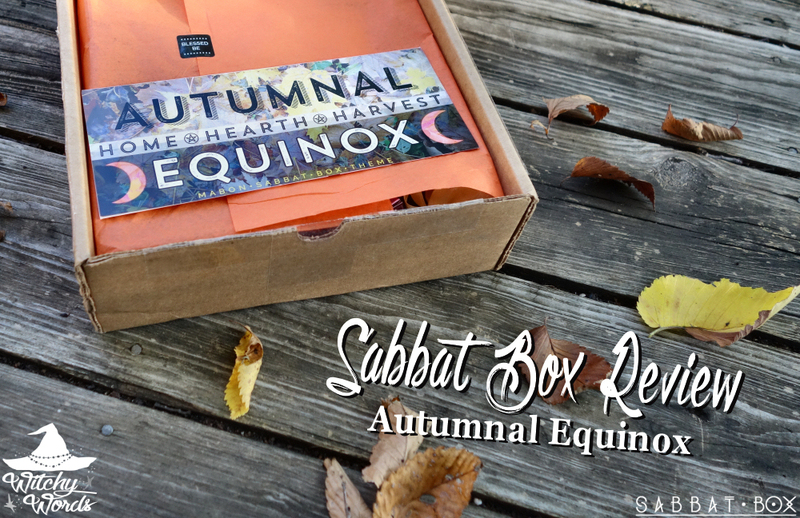 Each box contains a tri-fold pamphlet that contains a ton of information about the sabbat, the items inside and resources. This pamphlet alone is a great resource if you're unsure of where to start. Here's the aroma from the inside of the box: HEM's Pagan Magic stick incense. Strong amber and jasmine notes give this incense a soothing Middle Eastern feel. Certainly an interesting addition to the box. Another source of the scent of the box is The Sacred Well's Gratitude ritual powder. This versatile selection of ground herbs can be used as anything from loose incense to candle dressings to sachets and more! Gratitude is particularly essential to Mabon as we show our thankfulness for the bounty of the earth as well as the harvest of goals we have sewn year-long. Bonus: The Sacred Well has been a brick-and-mortar metaphysical store in Oakland, CA since 2007. This product doesn't just support this small business but also an online spiritual distributor, DeveraGifts.com. So you're supporting two businesses with this one! The scent may also come from Coventry Creations' beautiful, hand-poured home blessing candle. Sabbat Box usually contains a candle or two for each sabbat, but those from Coventry Creations tend to be my favorite. They burn steady, last an incredible amount of time and are charged with the most amazing energy. You may not be able to smell it from the outside - because it was well packaged and doesn't leak - but this ritual mist from Sun's Eye is exquisite. Ritual mist is perfect for those of us out there with asthma, which makes incense and sage bundle use difficult, or whom cannot stand the mess of throwing salt. Ritual mists can be used just as you would use any cleansing item to cleanse your space of negativity. It's particularly perfect for cleansing your house in a house cleansing or, of course, your ritual space. This mist contains strong citrus and spice notes in the water, and truly brings out the feeling of fall during the purification process. 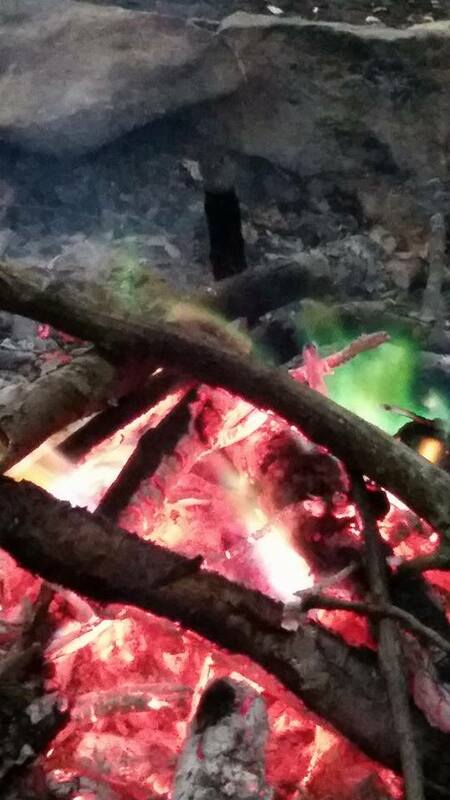 I'm saving my packet for Samhain, so hopefully I'll have a beautiful multicolored cauldron going for our ritual. How neat would that be? Another of my favorite items from this box is this gorgeous hand carved necklace from Eclectic Artisans. There were several different options you might have received in this box: Everything from the tree of life to a pentacle to a triquetra and more. But crescent moons are my absolute favorite, so I'm extremely happy with this one! I'll be wearing it all the time. Of course, we're continuing collecting the Llewellyn's Sabbat Essentials series. These little books are perfect pocket guides for the beginner on each holiday! Finally, I received a special gift in mine: An antique key and note as requested from my readers for our new house! This was an extremely thoughtful gift from Sabbat Box's creators and I couldn't be more thankful! Currently, you may notice that Sabbat Box is on a wait list. I would strongly suggest that, should you want to sign up, you get on that wait list. Spots are limited, so don't delay! If you've liked anything you've seen here or in previous articles, you can find much of it in Sabbat Box's store. So, even if you don't have a subscription, you can still have access to all of the amazing products seen here! Oh goddess what an awesome idea.I wish they could post it to Europe,so many nice items. I do believe they're willing to ship outside the US if you can pay the additional shipping costs. The savings is still pretty substantial. I would contact Sabbat Box directly though to be sure. What a lovely idea! I love the phoenix fire. I shall have to find some when I go back to the States. Wow ! what a wonderful Idea ! wished I'd of found u and Sabbat Box sooner but I guess this is how it should be. Many Thanks and Bright Blessings to you. The packages look amazing.....you can tell they put a lot of thought into each of them. I'm looking forward to when I can start receiving them!